Nameplates are the “business card” of your organization. They promote and clearly identify your brand into the marketplace, so the right combination of design and printing is critical. Screen printing, digital printing, selective texturing, doming for a 3D effect, and laser-etching are some of the processes that we can use to help create a unique “look” for your nameplate. Few things are as critical to your company brand as making sure that your color scheme is consistent. We use spectrophotometer technology not only to define and quantity the initial color targets, but also during production to make sure that we don’t see color “drift” over large batch production. 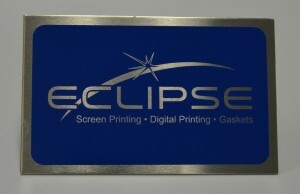 We will work with your team to assist in all phases of nameplate design. Our short-run and prototyping capabilities can help to work through multiple iterations to your get the look that is “just right” for your brand.